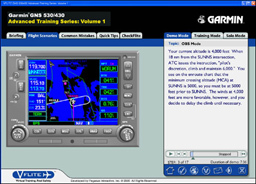 Volume 1 of the VFLITE (now Jeppesen) Advanced Training Series is designed for all pilots flying with the GNS 530 & 430 systems who want to learn how to handle challenging and complex procedures. It's also a great refresher tool to get you recurrent and minimize the "highly perishable skills syndrome" that occurs from infrequent use of your Garmin navigator. And it's the safe way to discover the full power of your GNS 530 & 430, compared to heads down in-cockpit training. Volume 1 of the VFLITE GNS 530/430 Advanced Training Series contains over 25 topics that build your confidence, show valuable shortcuts and a virtual flight that you'll never forget (at least we hope not). After first going through the briefing section, you'll be demonstrated eleven different advanced Flight Scenarios, which you'll then fly, initially with on-screen guidance, during the topic's "Training" mode. Then you'll fly the scenarios in the "Solo" mode, to reinforce what you learned in the Demo mode and practiced in the Training mode. 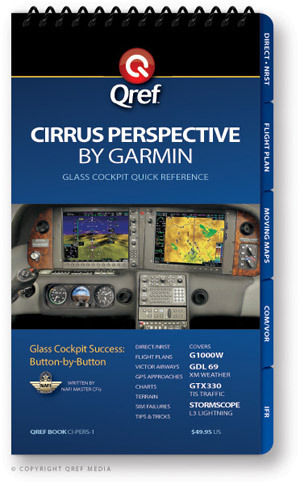 Now you'll be cleared for the CheckFlite™, the virtual flight from hell. Testing your GNS 530/430 operational knowledge thoroughly, the CheckFlite begins with a tricky IFR clearance and departure then continues with multiple amendments, unpleasant surprises, re-routes, an unpublished hold and finally concludes with modified approach & missed procedures.